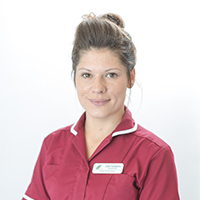 Jakki started at our Beccles practice on saturdays in November 2015 and has since progressed to doing more hours at Beccles and Loddon.Jakki also works part time riding and caring for horses which is a hobby she has enjoyed since very young. In her free time she enjoys walking her two dogs Fern and Bella and spending time with family and friends! Another love of Jakki’s is spending time with the cows where her partner works, either halter training on the farm or away at shows! Sometimes they even get walked down the road back to Jakki’s house!